It was after midnight in a harshly lit room, stashed away off a corridor inside a now largely deserted Liverpool Echo Arena. The smattering of journalists who bothered to hang around had one common query: Who on earth was going to do the press conference? An hour or so earlier, Paul Smith and Tony Dodson had punched, mauled and scrapped each other to a bloody standstill in their British super-middleweight title fight. Smith won, both were away having hospital treatment. Kell Brook, coming towards the end of his association with Frank Warren's promotional outfit, was stashed down this March 2010 undercard to complete a six-round knockout of unheralded Pole Krzysztof Bienias. The "Special One" had long since gone home. Who was going to give a quote anyone might care about? Maybe it was time to follow Brook's lead and head off into the night. At that stage, the freshly minted Commonwealth light-heavyweight champion announced his arrival. "AAAAAND THE NEEEEWWWW," Tony Bellew bellowed, in mock Michael Buffer style, the distinctive rainbow-striped belt above his head. Bellew had blasted away the woefully crude Ghanaian Atoli Moore inside a round in his hometown, collecting a first professional title in his 13th paid bout. He had a small but unexpectedly captive audience – not an opportunity "The Bomber" would pass up at that fledgling stage of his career or at any time since. The next target, namely Warren's then-golden boy Nathan Cleverly, was on the agenda. Bellew pledged to put his would-be rival "to sleep" but this wasn't normal soundbite smack talk. A blow-by-blow analysis of fighting styles and the pair's respective opponents and sparring work followed. This was forensic bombast from a man both immersed in his sport and with a laser focus on how best to land life-changing purses. 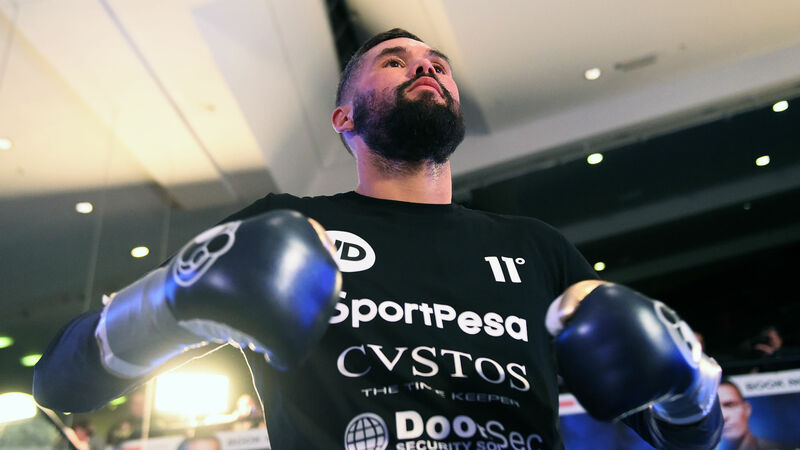 Eight-and-a-half years on, with the formidable Oleksandr Usyk and all the major cruiserweight world titles waiting in the other corner at Manchester Arena on Saturday night, it is to Bellew's immense credit that both ends of this desire have been realised. Goaded into a pair of bouts by the Scouser's motormouth that - like Cleverly before him - he started favourite, David Haye painfully made Bellew his fortune. Glory had been chased and hard earned before, from his increasingly emaciated light-heavyweight days to a moment of cinematic triumph beyond his Hollywood sojourn into the Rocky franchise. Bellew climbed off the canvas to slay knockout artist Ilunga Makabu at Goodison Park in 2016, home of his beloved Everton, and become WBC cruiserweight king. Operation Haye then took hold, with Bellew becoming a household name who divided opinion – the most profitable members of that fraternity tend to – and writing a pension plan that he cashed with that sublime, brutal left hook. The Usyk fight is reward for the boxing geek in Bellew, the side he wilfully reveals once the hard sell is done by talking at passionate length about the fights of next week, last week and decades ago. He knows beating the mercurially talented Usyk would be a victory to place in the latter category. It is opportunity for a win that would rank alongside any by a British boxer in the modern era, placing him in an exclusive club of fighters to have retired as an undisputed world champion. It would be equally celebrated by beery hordes on the night and thumbed after by boxing historians many years from now. It is a legacy fight. That Bellew even has the chance to write such a final chapter is a story of immense hard work and perseverance. A British amateur champion at heavyweight, the plan of bringing his natural power to bear at 175lbs was dangerously flawed. Or, more accurately, floored. He got the first Cleverly fight in 2011 and boxed superbly to a narrow decision loss that belied having been on the end of a knockdown against Bob Ajisafe and two more heavy tumbles versus Ovill McKenzie. Common consensus was he'd be blown away quickly by the Welshman. "I'd see stars off jabs at light-heavyweight," Bellew told iFL TV recently. That journey into deep space continued all the way to a second world-title bid – after the Cleverly loss – when Adonis Stevenson introduced him to the whole constellation. Then it was up to cruiserweight, an enduring alliance with coach David Coldwell, revenge over Cleverly in a stinker and being a star of a different kind alongside Sylvester Stallone and Michael B. Jordan in Creed. Back to the day job, there was little glamour in a gruelling points win over Mateusz Masternak for the European cruiserweight crown in December 2015. An uncelebrated victory, it felt like an impressive realisation of the talents Bellew had guided through the professional ranks with a sharp boxing brain and ample reserves of grit. The Makabu and Haye wins moved him beyond that, leaving 12 more rounds and the ultimate challenge. And the new? If the upset happens, Michael Buffer himself will be hollering those words to a worldwide audience. Rest assured, Bellew will handle the press conference.